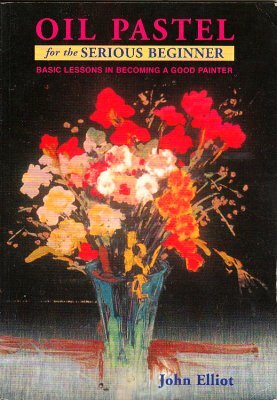 Oil Pastel for the Serious Beginner by John Elliott is one of only two good introductory texts on using oil pastels. It has plenty of information and the advantage that it's still in print as of this writing. It has a 7" x 10" paperback format, reasonably inexpensive at $19.95 cover price -- you can always do better at online stores and various bookstores, but cover price always gives an indicator of price range. Plenty of good full color illustrations show a wide variety of styles from loose to detailed, sketching to painting, abstract through realism. All of the examples are by John Elliott, showing the range this painter has in style and technique. I was particularly impressed with his portraits and figures, he has a great knack with skin tones, likeness, feel in any rendering of a human being. I wasn't expecting realism in Oil Pastel for the Serious Beginner because the loose Impressionist cover gave me the idea that was John Elliott's style. Instead, I found out he's mastered numerous different styles and makes oil pastels sing when he comes up with a new concept. The book starts with a Materials section like most art instruction books and while it doesn't mention sanded pastel surfaces or Colour Shapers, gives a good overview of most of the tools and materials available. It's after that section that the real fun starts. Elliott organized his book by subject -- Still Life, Landscapes, Faces and Figures are the next three sections before he goes into using wash techniques and doing mixed media. Sorting it out this way makes it very good for going directly to the type of subject you're interested in painting. I read it through, but this organization is goof for a reread when I'm just looking for a landscape solution or trying to figure out how to get eye details with a blunt stick. Throughout each of these sections, Elliott shows progress photos of serious paintings he's done. One of his examples is particularly good with many stages shown on how to build up skin color and depth in a formal portrait of his wife. All in all, it is definitely a good reference and has a number of unique tips that make it worth getting even if you already have Kenneth Leslie's book. I am glad to have both -- and this is a pretty short shelf for a fine art medium. If I were doing watercolor or oils I could fill an entire bookshelf with dedicated volumes about the medium each of which has good introductory lessons. In oil pastels I've only found two -- and John Elliott's book is strong enough to be a good investment.